We hope you are having a MAGNIFICENT summer! Our Good Vibes release includes lots of wonderful products to celebrate summer, but you might remember some pretty spectacular products from last year’s One of a Kind collection. In celebration, let’s take a look at some glorious cards created with goodies from our One of a Kind release! Amy embodies the deliciousness of summer with this happy card featuring the Artsy Fruits stamp set from our One of a Kind release. You can see Amy’s original post HERE. And if you want to see how she created this card, she’s got a fun video that you can watch HERE. This vibrant all die cut card from Jennifer features two dies from the One of a Kind release: Heart Sprinkle Trail and Script Thanks. In her original blog post which you can see HERE, Jennifer created four fantastic cards from this release, and of course, there’s a wonderful video that you can see HERE. 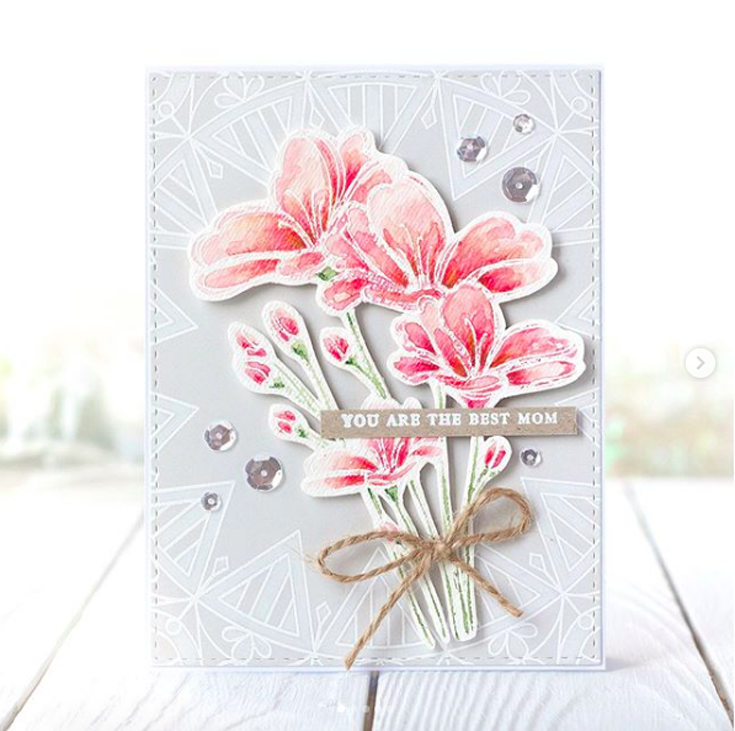 The Bouquet of Thanks stamp set from the One of a Kind release is a showstopper, and Kristina makes it SHINE on her gorgeous card. She paired the newer Center Cut Burst Background stamp with the set on this stunning design. Visit Kristina’s original post HERE. Cute flowers just NEVER go out of style, and even though the Pure Sunshine release is four years old, the Scribble Flowers stamp set is still available in our store! You can check Nichol’s original blog post HERE. And there’s even a how-to video that you can see HERE! Wonderful creations to look back at again & again. Like the use of the vellum, the stars, sparkle & more. OhYea! I loved those flowers. Need to go check those out at your site! Wow! Love Amy’s cards! I love her colouring! Beautiful creations!!! 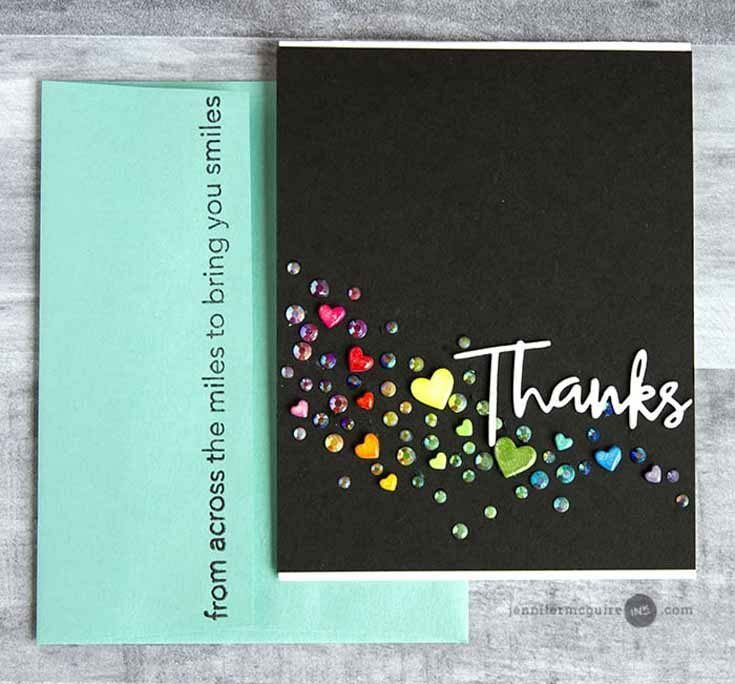 These are so great … after seeing that card by Jennifer I had to put that die in my wish list! So cute! I love seeing examples with stamps I own! Love “Throwback Thursdays!” So many great projects and techniques we may have forgotten to explore. Awesome inspiration to see these again! I love all the inspiration here at Simon Says Stamp! I didn’t know about the galleries for the releases so thank you! Don’t remember that beautiful watermelon card but totally love it! I love throwback Thursday! I sometimes forget about the previous stamps or don’t have the time it takes to come up with a creative idea to use them. I’m always making cards on the fly for specific occasions. So I love to see these ideas again and remind me that I have a lot of other stamps to play with, not just the new ones. Those are some great examples for us. So different from each other. Love throwback Thursday! A good reminder of inspiration sitting in my inspiration folder! I love those colourful hearts on Jennifer’s card! You got to love Throw Back Thursday’s, I do!!! These are ALL such great cards and sets. I love seeing Throwback Thursday’s highlights. Gorgeous!! Love the great creativity by these amazing ladies! Always inspiration here, whether new or old. Thanks for that! I love throwback Thursdays. All the best cards and stamp sets! Gorgeous! Love all of these cards–thanks for reminding us! Awesome throwback. Love the cards. Well I am glad you showed these again , because I did miss them the first time around. Beautiful cards and thanks for sharing them again. Fluttering By Blog Hop WINNERS!